SmarterHomeAutomation.com has revealed their first annual Holiday Gift Guide, which features some of the hottest smart products out there. The guide aims to aid in choosing the right home automation gear for friends, family, and their own smart home this holiday season. Holiday shopping doesn’t have to mean breaking the bank. 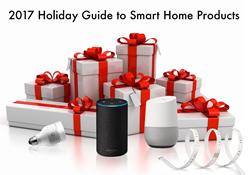 This year, SmarterHomeAutomation.com has come out with their very first Holiday Guide to Affordable Smart Home Automation Gifts, which contains insight into a number of smart home gear ranging from stocking-stuffer price to “the big gift.” With so many home automation devices on the market, it can be difficult to decipher which smart gadgets work with each other, and a feature on which Personal Assistant based ecosystem is best for them – Amazon Echo/Alexa, Apple HomeKit/Siri, or Google Home/Hey Google! The guides seek to lead buyers through the ever-growing list of smart products and aid them in choosing the ones that will work best for them. They feature gadgets from big names like Sylvania, Lutron, Skybell, and more, including smart lighting, video doorbells, personal assistants, and smart lock products. SmarterHomeAutomation.com has sifted through the best smart products to bring you a comprehensive guide that speaks on each products’ features and capabilities to make building a smart solution easy. Sylvania Flex RGBW Strip Lights (formerly called Lightify Flex) – These smart strip lights bring a pop of color into the home, with the entire color spectrum at the user’s disposal. LIFX Collection – This company has some of the most affordable smart light bulbs around, with bulbs starting at just $24.99. They’ve recently made their entire line compatible with Apple HomeKit, controllable by Siri – a major plus. Lutron Caseta Starter Kit – A reliable, whole home lighting solution that requires installation of smart dimmers and switches, and can be controlled by Alexa. Skybell HD – An feature laden, smart video doorbell that films in HD, contains a two-way audio system, and has night vision for ultimate security. Amazon’s Alexa, Apple’s Siri, and Google Assistant – The feature piece of this holiday guide discusses the benefits of each smart assistant to help buyers decide on which to use to automate their home. View the 2017 Holiday Guide to Affordable Smart Home Automation Gifts. SmarterHomeAutomation.com reviews the latest home automation products, including Apple HomeKit, Z-Wave and Amazon Echo, Philips Hue, Lightify, WeMo, Nest, Ecobee, Google Home, Skybell HD, August Home, and more. The site features comparisons between the top smart personal assistants, as well as articles and features on new products that are just coming out. It is the sister site of ProjectorReviews.com, which has, since 2000, published more than 500 projector reviews, in-depth articles on display technologies and industry trends, as well as annual reports covering the latest education, home theater, and pico/pocket projectors. Home automation began in the home theater, after all.